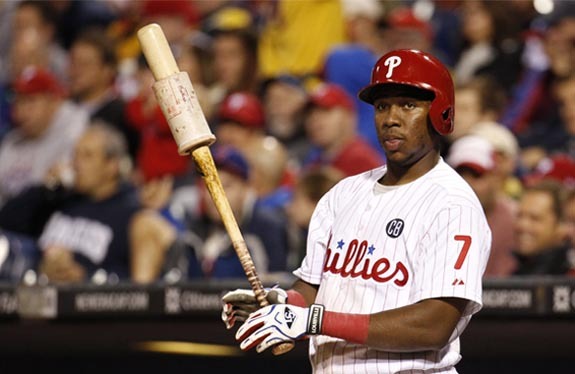 The Phillies downed the Atlanta Braves last night in walk-off fashion as Maikel Franco delivered a two-run single in the 10th to give the Phillies a 4-3 win at Citizens Bank Park. The single was the first walk-off hit for the Phillies that turned a deficit into a win since Pat Burrell accomplished the feat in 2008. Franco has now knocked in seven runs over his last four games. Starter Jerad Eickhoff tossed five innings, allowing one run on two hits. He walked a pair, but struck out seven. Righty Zach Eflin makes his second start of the year with the Phillies this afternoon. He tossed five innings to a no-decision last week in New York, surrendering two runs on three hits. The 23-year-old hurled his first major league complete game and secured his first major league win in an outing against Atlanta last year. He surrendered one run, scattered six hits, and struck out six. The Braves counter this afternoon with Mike Foltynewicz. The righty went 1-1 with a 5.06 ERA in two starts last season against the Phillies. A win this afternoon gives the Phillies their first series sweep since September 20-21, 2016 when the club took a two-game series from the Chicago White Sox. The last three-game sweep came August 12-14, 2016 against the Colorado Rockies. Following today's matinee the Phillies have off day before hosting the Miami Marlins for a four-game set beginning Tuesday.